If you are vegan (or just allergic to certain ingredients), store-bought pumpkin pies are most likely just a hazy memory. I experimented with several recipes just prior to Thanksgiving and settled on this particular pumpkin pie recipe. Please note that this pie does not taste like a store-bought pie, which may tend to have a very dense filling and a very certain taste (I cannot describe it, but store-bought pumpkin pies all seem to taste the same delicious way). This filling, which is also somewhat dense, has a slightly different taste -- still perfectly pumpkin-y, however -- so you might need a few bites to adjust. 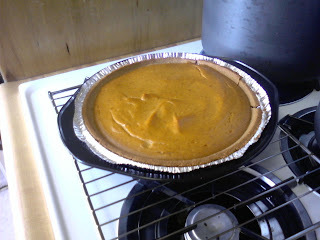 As usual, my vegan pumpkin pie passes the stepson test (it is also pareve), and is therefore worthy of publication. This recipe comes from Colleen Patrick-Goudreau's "The Joy of Vegan Baking." 4. Bake for 40-45 minutes, until the crust is lightly browned and the outermost inch of the filling appears to be set. The remaining filling towards the center will firm up a bit as the pie cools. 6. Let the pie cool until it is at room temperature and then put the pie in the fridge for 1-2 hours to set. I find that this pie holds well in the fridge for at least 3 days. For all I know, it holds even longer, but we always eat it all by day 3!